Many Biafrans were ready to carry on Biafra restoration by all means after the war(1970), but the British and Nigerian government deceived Gen. Ojukwu to join Nigerian politics to get what He wanted, and Ojukwu reluctantly accepted and joined; Have Biafra been restored since then till now? The answer is NO; Our situation in Nigeria today is worse than before. Ojukwu joined and even contested in Nigerian politics, hoping to get a political appointment that will aid the freedom of Biafrans, but all He got was frustration. Now, British and Nigeria have come again with a devilish alternative which is Vice President and Biafra restoration; The moment we go into politics in Nigeria hoping to get Biafra through political position/process, we're finished as a people. 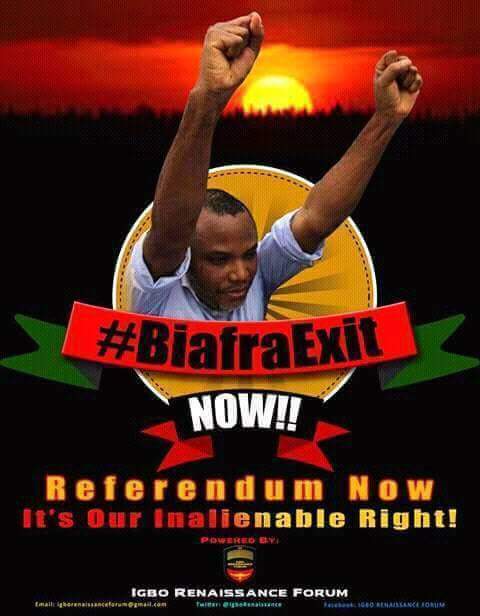 In Nigeria, Democracy is upturned; If there's any political position in Nigeria that would have given us Biafra or aid Biafra agitation, Nnamdi Kanu wouldn't have told us to Boycott election; IPOB understood very well that election Boycott is the first step in Bringing down an illicit government, that's why we(IPOB) can't validate their tyranny by voting, we must Boycott Nigerian election. The men you're Atikulating and Jubrilising/Buhari for, have not voted for any Igbo man. ★Buhari and Atiku voted against Alex Ekwueme; ★Buhari and Atiku voted against Gen Ojukwu; ★Buhari and Atiku voted against Dr Ebele Goodluck Jonathan. Atiku campaigned for Buhari against Jonathan in 2015 under APC; Now, why is He contesting against the man He campaigned for? Igbo Atikulators and Buhariasers I'm talking to you. You're foolishly campaigning for two Fulani men while your own brother Kingsley Moghalu is begging for support; Do you now prefer Vice president to president? You're crying no job, poor education, bad roads etc, that's not your problem at all, your problem is Nnamdi Kanu; You're fighting the same man that is fighting for your liberation because He told you not to validate the supremacy of those who oppressed you by voting; Meaning that you must boycott election. If not for IPOB, do you think the northerners would have remembered or selected an Igbo man(Peter Obi) as vice president? You said sitting at home on election day is a vote for Buhari, In fact, you concluded that Nnamdi Kanu is working for Buhari; If that's the case, Why is the same government you claim we(IPOB) are working for still killing our(IPOB) members? You hate Nnamdi Kanu not because He's evil, but because He's stopping you from collecting 1,500naira on election day for renewal of your slavery. That is it. Just for once, do something different from what you have been doing wrong; Sit at home on 16th February to register your displeasure over the injustice on our people; You have been voting and your vote has never counted and will never be, so why wasting your time validating the supremacy of those who oppress you? To whom brain is given, the sense is expected.